Other than loving Fig Newton Cookies as a kid I have never considered myself much of a fig fan, though whenever they are prepared for me by someone else I can’t seem to get enough. Figs are in season so I decided to buy a pound and figure out what to do with them. Up until last night all I had done was add them to my juice mix. Last night was pizza night. We had a couple pre-made pizza doughs that we decided to split into four small pizzas, so I decided to get out the figs and make a fig pizza. Initially I was a little apprehensive to try it but then came hubby who swooped in and started eating away. He couldn’t stop. When I finally got the nerve to try it I was very happy with the results. I think the fig and cashew spread would work well on crackers, bread or even in phyllo dough. Mix figs, balsamic vinegar and syrup together and let marinade for 1 hour. Once figs are have marinated prepare dough per directions. Cover dough with cashew sauce (we covered our crust also and it was great!) Spread figs over cashew sauce using a fork so that you capture some of the marinade but not all of it. Scatter onions and bacon bits per preference. Bake per dough directions. We baked ours at 450 degrees for 10 minutes. Enjoy. In a sauce pan saute garlic and sesame seeds in olive oil over low heat. Remove from heat and mix in all other ingredients. 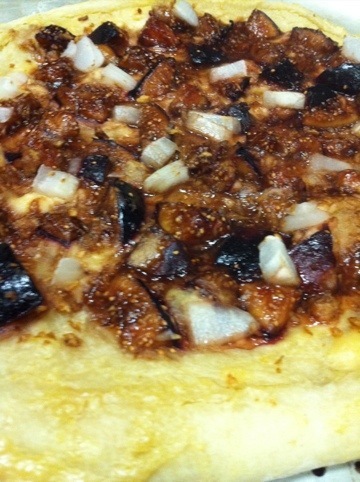 Gallery | This entry was posted in appetizer, Bread, Main Course and tagged figs, pizza, vegan. Bookmark the permalink.